Gori (Georgian: გორი ) is a city in the Shida Kartli region of Georgia most famous for being the birthplace of Joseph Vissarionovich Jughashvili, better known as Stalin. Today, surprisingly, it does not look much different from when Stalin ruled the USSR. Gori is also located a short drive from Uplistsikhe, an ancient Silk Road cave city and former regional centre of pagan worship. The name Gori may look and sound like the plural form of the Russian word for mountain (горы, GO-ry), but the name of Gori, incidentally meaning hill (singular) in Georgian, is much older than the first Russian contact with the Georgian kingdoms in 1500s. Many marshrutkas run daily between Tbilisi's Didube market and the central square of Gori. If you're arriving with the metro, go directly through the market (one-story houses) until you reach a square with only marshrutkas on it, just ask one of the drivers. Buses leave hourly from about 07:00 to 20:00, and the ride costs 3 GEL a person. Another option is to take a taxi, which also leave from Didube bus station. Listen for the cab drivers calling out "Gori, Gori," and get in their car. These cars leave as soon as they are full, so your wait could be anywhere from 5 minutes to an hour. The fare for one person in a shared cab should be 5 GEL. If you do not wish to share a taxi with others, then the cost should be about 20 GEL. Be sure to negotiate this with the driver before you get in the car. You can download the Georgian Railway Tickets app to easily purchase your ticket in advance (only possible a few hours before the train's arrival). List of passengers will be printed and the documents of the main ticket holder will be checked upon boarding. Tickets are not sold at every station en route, nor are they sold on board. Many trains run through Gori on their way to or from Tbilisi. Last train to Borjomi leaves at 18:00. 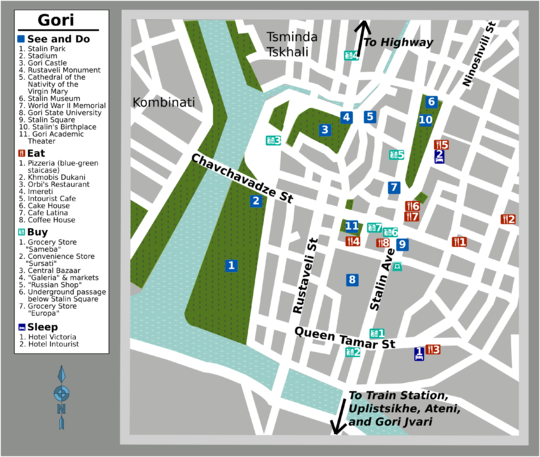 Everything that a tourist would want to see within Gori is easily accessible on foot; the city centre is compact. To get to nearby Uplistsikhe, however, it is best to hire a taxi. Taxis are easy to find around the main square and drivers will be willing to wait for you while you explore Uplistsikhe so that they can drive you back to Gori once you have finished. The whole taxi ride, including waiting, should not cost more than 25 lari and drivers will go as low as GEL15 if you are a hard bargainer. Public transport to Uplistsikhe is much cheaper at GEL1 each way. Buses go from Stalin Avenue to the village on the opposite side of river. A train departs to Uplistsikhe from Gori at around 10:00 and returns around 17:00. A bus also makes the trip, departing Gori's bus station once around 09:00 and again at noon, returning around 15:00. If you are driving, head south in Gori on Stalin Ave across the Mtkvari River and turn left on the second main cross-street (not the one running right along the river). This road will take you through the village of Khidistori, where you should try to maintain a straight course, bearing to the left if at a fork, and past the village you should approach Uplistsikhe. If you are feeling lost, ask anyone for directions (try "sahd-ah-rees oo-plee-see-khay?") and they will point you right. Tourist information centre is located behind the Stalin Museum. Unlike the majority of Georgia, Gori is full of people who still revere their home-town boy who made such an indelible mark on human history. The principal attractions (as well as the principal revenue earners) within the city are monuments to Stalin and they are all located on or nearby the main square along Stalin Ave.
Stalin Museum, 32 Stalin Avenue, ☎ +995 270 27 52 15 ([email protected]), . 10:00–18:00. There's a souvenir shop adjacent to the ticket office with quite overblown prices. There is an English guide for groups, but she is not fluent and speaks too fast. It is also advisable to take the information with a bit of salt. The Stalin Museum is the highlight of a visit to the city of Gori. Behind its faux-Venetian façade is an impressive museum filled with paraphernalia and media documenting the life and careers of I.V. Jughashvili. The museum's portrayal of Stalin is one-sidedly nostalgic, which can be jarring for visitors, but the exhibits are actually quite well done and there are ample Georgian babushkas throughout the museum who will be more than happy to elaborate on the exhibits and answer questions. Unfortunately, the exhibits are overwhelmingly in Russian and Georgian, to the disadvantage of most Western visitors. But the main show requires no language—Stalin's death mask. Stalin's bronze death mask is not so exciting in and of itself, but the lighting and bizarre, personality cult-chic, red velvet display will surely elicit goose bumps. There are no English information pamphlets, but at the ticket office you can ask about an English or German-speaking guide. They are sometimes available for groups and will often show you the inside of Stalin's home and train car GEL10 for foreign tourists, plus another GEL5 if you want to see the train carriage used by Stalin.. edit. spent his childhood until 1883. Stalin Statue Few of the many statues of Stalin throughout the former USSR have survived to this day and Gori's is certainly one of the most magnificent and well-kept. This large statue long stood in front of Gori's city hall, located up Stalin Ave. from the end of the main square, opposite the Stalin Museum, until a bush-league surprise removal in the middle of the night by the government in 2010 (over presumed objections by Gori residents and officials). This statue was not present in July 2013. There are plans, however, to move the deposed statue over to the Stalin museum. There are two other Stalin statues in Gori: a replica of the main statue is in Stalin Park and the second—of Stalin as a young man—can be found beside Gori State University. Uplistsikhe (უფლისციხე—The Fortress of the Lord) is easily one of the oldest existing cities in Georgia, although it is now uninhabited save tourists. Founded in the sixteenth century BC and carved out of rock, this was a bustling city over 3000 years ago and was, before the introduction of Christianity in the fourth century, a major regional hub of Caucasian pagan worship. After Saint Nino converted King Mirian II of Iberia, the pagan temples of Uplistsikhe were sacked and the city went into long-term decline. Its decline was hastened by devastation at the hands of the Mongols in the 12th century, although it remained inhabited, serving as a stop along the Silk Road until the 15th century. Highlights not to be missed include: a Hellenistic amphitheatre overlooking the Mtkvari river where residents of Uplistsikhe once enjoyed Greek-style performances, a functioning 9th century church built atop the ruins of an ancient pagan temple to the Caucasian sun god, a once pillared seat of kings, and a fun cave tunnel leading out of the city to the riverside. Also be sure to note the round storage spaces once used for wheat and the shelf-like spaces for medicinal herbs—a veritable bronze age pharmacy! Uplistsikhe is of considerable historical interest and is properly enjoyed with a guide. Chances are good that your guide will find you before you ask (there is not much alternative employment in this area) and there is a good chance of finding an English-speaking guide on site. Be sure to negotiate prices with the guide though, and don't accept the first offer. Entry fee to the site is GEL7 (Sept. 2018), the receptionist will try to sell you leaflets and books but don't fall for it as she is trying to rip you off. The guides sell the same books for cheaper. Uplistsikhe suffered long years of neglect and vandalism and is currently undergoing significant restoration as a UNESCO World Heritage Site. Accordingly, certain areas may be closed off from direct contact during your visit, although all sites will still be viewable. It should cost GEL10 to get a taxi one-way to Uplistsikhe. Buses also go to the village on the other side of the river, about 1km from Uplistsikhe. These run fairly frequently and cost GEL1. Some buses go all the way to the parking lot and cost GEL2. The bus from Gori leaves from the bus station every half past the hour. Ask someone which minibus to get it (there was no English sign); someone in the ticket office guided me to it. Getting a bus back to Gori is very simple (just walk along the main street of the village until you see a group of people waiting by the road, just near the point where it meets another road). Goris Tsikhe stands at the heart of the city atop a large hill and is the only structure in town that could dwarf the Stalin statue. According to locals, Goris Tsikhe's most notable moment in world history occurred in the first century BC, when it was conquered by the Roman General Pompeii. The current ruins are more recent, however, having been built after the Mongol invasion. There is not much to see inside the ruined castle's walls, but there are nice views of the city and the surrounding dark green plains of Shida Kartli. The approach to the ruins was recently repaved and the surrounding area cleaned up, but the site remains free and the only price of admission is the short, steep walk up the path. There is an assemblage of 7 statues near the entrance. According to locals, these statues of 7 sitting males in medieval attire commemorate 7 brothers killed in a German air strike during WWII. The church at Gori Jvari stands on a outcropping of rocks and can be seen from practically anywhere in Gori. Originally built in the 12th century, it was burned down by the Turks, rebuilt, and destroyed again by an earthquake in 1920. The current church was built in the 1980s. On days commemorating St. George (November 23 and April 23), Gori residents flock to the church with sacrificial sheep. The sheep are walked around the church three times, and in accordance with Orthodox tradition, are taken just off the church grounds for slaughter. On a clear day, the view of the Caucasus from the church is spectacular. The moderate hike is approximately three hours round trip. To reach the trail head, walk south along Stalin Avenue until you cross the river. The road will cut to the right and then cross the railroad tracks. On the other side of the tracks, turn right then take the first left and then the windy path up the hill that is immediately on your right. This twists up the hill. If you find a graveyard on your left, you are going in the right direction. There are more hiking options along the mountain ridge above Gori Jvari and there a number of ruined churches scattered through the area. There are a growing number of shops in Gori selling Georgian crafts and gifts, and which are cheaper than in Tbilisi. The Stalin Museum offers a limited number of kitschy souvenirs in their main lobby. Small shops are also popping up in the city centre. One good bet is the underground pedestrian tunnel below Stalin Square. Shop No. 14 in the underground offers a variety of handmade Georgian crafts made by local street children at a Gori-based NGO. Icons and other religious paraphernalia can be purchased at the shop beside the Cathedral of the Nativity of the Virgin. These can make for interesting gifts. Shops along Chavchavadze Street, perpendicular to Stalin Avenue, sell Georgian jewellery and icons as well. There is not much nightlife in Gori and the bars and restaurants are basically one and the same. Almost all the restaurants listed above offer Russian and Georgian beers as well as Georgian wines of varying quality. One standout is Orbi's Restaurant, which offers a local beer for 70 tetri (about 0.30 Euro) a pint. In the summer, beer tents pop up around town and offer the usual selection. But to really enjoy a summer evening in Gori, it's best buy a bottle of beer or wine at a store and join the crowds of young people at the birzhas by the Stalin Museum and Stalin Park. Some of the nicer shops are beginning to offer imported beers, but check the expiration date on the bottle. Gori is conveniently only about an hour away from Tbilisi by marshrutka, so it is possible to visit Gori and Uplistsikhe as a day trip. There are not many commercial opportunities for overnight stays, though the options are improving. Staying in Gori does present a cheaper alternative to Tbilisi, and can be a pleasant change of pace from the capital. Relatively few people in the world cherish the memory of one of the 20th century's greatest leaders, Joseph Stalin, but most that do live in Gori. Try to avoid denigrating their hometown hero. Gori is a small, poor city and its residents really do not want to listen to foreigners "attacking" their "heritage." Visitors to local churches should respect Orthodox customs. Women should wear longer skirts and cover their head (either with a hat or with a head scarf). Some churches will provide this for you. Foreigners are generally welcomed, but be mindful of those worshipping. Taxis are most easily requested by phone (# is written on taxis, 1km - 0,6Lari). They're also hailed by approaching bored looking men sitting in cars around the city; if you have any trouble, just ask anyone, "Sahd ah-rees tahk-see?" and they will get you a ride (picking taxi on a street costs extra 1 Lari). Marshrutkas back to Tbilisi take off approximately every half-hour from Gori's bus station located beside the central bazaar (GEL3.50 for bus, GEL4 for marshrutka; 1.5 hours). If you've missed the Tbilisi-bound marshrutkas ask for taxi vans near theatre (Tsabadze st.) or near VTB bank. Expect to wait for 3-5 passengers to fill van, price - GEL5 (1h drive). To reach highway you have to use taxi. Taxi rides from the center to the highway generally cost GEL2; alternately, you can stop city marshrutkas Nos. 6 or 24 along Chavchavadze Street and ride to the highway for 40 tetri. If you're travelling west, there are daily direct buses and marshrutkas to Kutaisi, Borjomi, and Batumi. Timetables are posted in the bus station. There have been accounts that there are barely any mashrutkas heading west in the afternoon and evening (needs to be checked). All westbound vehicles pass through the transport hub in Khashuri, so you can take a marshrutka to Khashuri departing every half hour (GEL2, 1h) and transfer to another one from there. The Tbilisi-Batumi night train (GEL15-25 to Batumi, 7h) passes through Gori at 23:30. Tickets can be purchased only one hour in advance, so be sure to show up to the train station early. There are also other trains going throughout the day, although not much. Locals generally do not know of the existence of these trains and information is difficult to come by. As of September 14 (a Friday), a stop train to Kutaisi departed from Gori at 16:30 for 1 lari, and arrived around 21:00 in Kutaisi (roughly 40 stops in between, very slow and hard plastic seats. Okay scenery). On this particular Friday there were also trains to Borjomi (17:51), Poti (18:46) and Tbilisi (19:17). More trains are available, although sparsely and again there are very slow. Additionally there are hourly north-bound buses during the day from the main bus station to the villages north of Gori on the road to Tskhinvali, the capital of South Ossetia. However, since the South Ossetian conflict in August 2008, crossing the border is very difficult, and there are security concerns in the area around the border.